More than thirty years ago, Congress gave local governments the power to impose “franchise fees” and other regulations on cable television service. It was part of a broad framework for shared national and local authority over cable television in the 1984 “Cable Act,” which laid the foundation for the cable (and eventually satellite) TV boom of the 1980s and beyond. But recently, a number of local franchising authorities have tried to upend that federal policy and claim the right to impose local taxes and regulations on the internet by seizing on the fact that some broadband providers also offer cable television services. Now, the Federal Communications Commission (“FCC”) is rightly working to put a stop to this local government internet power grab – moving to make clear that the Cable Act only allows local franchising boards to tax and regulate cable companies based on their cable television operations. If every local franchising board in the country can impose its own rules and fees on internet providers, the freewheeling and open internet we all enjoy today will slowly grind to a halt. The resulting cacophony of regulation will overwhelm operators, slowing down cyberspace and making it less reliable and less secure. It will drive away new investment needed to continue to achieve ever-increasing speeds users have come to take for granted. And it will confuse consumers who expect the internet to be a consistent experience everywhere they go. For that reason, the FCC’s “Section 621 Proceeding” must move quickly to shut down the local power grab by making clear that neither the Cable Act nor any other source of local regulatory power authorizes franchise boards to tax or regulate the internet or any other non-cable-television businesses. The future of the internet and our unfettered access depend on it. Today, activist organizations, including Free Press, Public Knowledge and Fight for the Future, plan to descend upon Capitol Hill offices to underscore their disapproval of Federal Communications Commission (FCC) Chairman Ajit Pai’s proposed plan to repeal the Obama Administration’s 2015 “Open Internet Order” classifying Internet Service Providers (ISPs) as public utilities under Title II of the 1934 Communications Act. In anticipation of their effort, the Center for Individual Freedom teamed up with the Taxpayers Protection Alliance to provide Congress with a “Reality Check” of key messaging and themes to expect from those groups as they visit with lawmakers. An unfortunate byproduct of life in a democratic system is that complex policy matters are often reduced to simplistic slogans, and politicians exploit attractive terms to peddle harmful proposals. The reality is far different. In truth, the bill constitutes crony capitalism on behalf of some industries at the expense of others, and would stifle innovation and undermine rather than boost consumer welfare. This battle was already fought and won at the federal level, when Congress employed the Congressional Review Act to rescind an Obama Federal Communications Commission (FCC) rule to the same effect. Supporters of the proposed legislation will tell you that it’s necessary to protect consumers against internet service providers who seek to gather and sell private information. In that vein, the bill would require that consumers “opt in” before service providers could use their data to improve service or tailor advertising to consumer preferences or needs. Current law, however, already allows consumers to “opt out” from collection of non-sensitive data if they choose. Notably, few consumers choose to do so, because that would interfere with their ability to enjoy more customized online service that they prefer. It’s also important to note that current law also already requires that consumers “opt in” to allow access to particularly sensitive personal information. So what the proposed law would do is impose a one-size-fits-all mandate that most customers currently don’t choose. Secondly, the Federal Trade Commission (FTC) already possesses authority to protect consumers against privacy violations and punish improper data collection should it occur. That’s how the system has worked for over two decades while the internet flourished like no innovation in human history. And that’s why the FTC expressed opposition to this sort of “privacy” legislation at the federal level before it was quashed. California’s attorney general is also empowered to investigate and seek legal remedy for “unlawful, unfair or fraudulent business acts or practices” under California’s Unfair Competition Law. Another flaw in the bill is that it conspicuously exempts powerful content companies like Google, which obviously earn their billions by monetizing consumer data for purposes of advertising and sales. Those content companies access customer personal information just as much as service providers, if not more. After all, consumers tend to access the internet via different devices and networks, whereas they tend to use the same search engines (i.e., Google) and visit the same content sites. Accordingly, the proposed bill amounts to crony capitalism benefitting one set of companies at the expense of another set. California’s proposed law would create the additional problem of imposing burdens that other states don’t impose, thereby creating a “spaghetti bowl” regulatory effect for companies that offer nationwide products and services. Online privacy remains a natural and important concern for consumers in California and across America. But we must also beware politicians pushing laws that undermine consumer welfare, threaten the thriving internet sector and amount to crony capitalism by picking winners and losers in the marketplace. The new Federal Communications Commission (FCC) has been one of the most consistently outstanding agencies of the Trump Administration in terms of restoring regulatory sanity after eight years of politicized abuse throughout the Obama Administration. Unfortunately, the FCC remains under assault from groups seeking to leverage federal policy toward its own advantage, and continued vigilance is critical. In just the latest illustration, broadcasters have begun pressuring the FCC to allow television stations to begin transmitting signals in a new “ATSC 3.0” format. Also referred to as “Next Gen,” such a transition would impact every American consumer who watches television, and not necessarily for the better. In addition to costing taxpayers, it could create a de facto federal mandate on television service providers. First, the ATSC 3.0 format is incompatible with existing televisions and set-top boxes, meaning that Americans who wanted to simply continue watching television would have to purchase new equipment or join a pay-TV provider that had spent the time and money transitioning its equipment. That, of course, would be a cost transferred to customers. Second, the proposed transition could also mean weaker signals for consumers who choose over-the-air broadcast. That’s because it would involve simulcasting from facilities with smaller or new coverage areas, placing rural voters in particular jeopardy. Additionally, ATSC 3.0 could bring more dreaded blackouts, since broadcasters could seek to force pay-TV providers to carry ATSC 3.0 signals under threat of blackout (a tactic broadcasters have exploited in the past on behalf of such efforts as ratcheting up retransmission fees). Accordingly, broadcasters can leverage their government-provided bargaining position to obtain higher fees for themselves via threat of consumer blackouts, which they’ll surely employ in their effort to force consumers and providers to purchase the new equipment necessary for reception. That, of course, translates to higher costs for consumers, or giving up their favored programming altogether. The better alternative is to let market forces work, by making the Next Gen transition wholly voluntary. Broadcasters operate under an umbrella of government license, which allows them to hold consumers hostage in order to increase revenues. Accordingly, the FCC should continue its good works by rejecting broadcasters’ attempt to leverage federal bureaucracy to achieve a new government handout to be subsidized by consumers. Next Gen should be a truly voluntary standard that doesn’t leave consumers holding the bill for the broadcasters’ innovation. ALEXANDRIA, VA – Today, the Federal Communications Commission (“FCC”) voted to advance a Notice of Proposed Rulemaking (NPRM) on the “Restoring Internet Freedom” proposal championed by Chairman Ajit Pai and Commisser Mike O’Reilly that would return federal internet regulatory policy to the light-touch approach that prevailed from the 1990s onward, until the Obama Administration FCC moved to reclassify the internet as a “public utility” in 2015. “Beginning in the 1990s, the internet flourished and transformed our world like no innovation in history for a simple reason: Administrations of both political parties over two decades, beginning with Clinton/Gore, wisely chose a ‘light touch’ regulatory approach to the internet. “Then in 2015, the Obama Administration FCC suddenly and radically reversed two decades of bipartisan consensus by moving to reclassify internet service as a ‘public utility’ under laws enacted in 1934 to regulate old-fashioned copper-wire telephone service. There was no justification for that sudden reversal, and it was not based upon evidence, law or logic. The internet obviously wasn’t ‘broken’ or in need of heavy-handed federal regulatory ‘fix.’ It was merely a scheme to extend government control over yet another sector of our economy. “Nor was reclassifying the internet as a ‘public utility’ something the American public supports. A recent Morning Consult survey confirms that an overwhelming and bipartisan 78% of voters prefer little or no government regulation of the internet, with only 12% favoring a heavy-handed regulatory approach. A broad 51% to 33% majority believes that the internet shouldn’t be regulated as a public utility, and a two-to-one majority agrees that regulating the internet as a utility slows innovation and decreases private tech investment. “Unfortunately, the Obama Administration FCC’s decision to reclassify the internet as some sort of Depression-era ‘public utility’ had immediate negative consequences, confirming the public’s expectation. 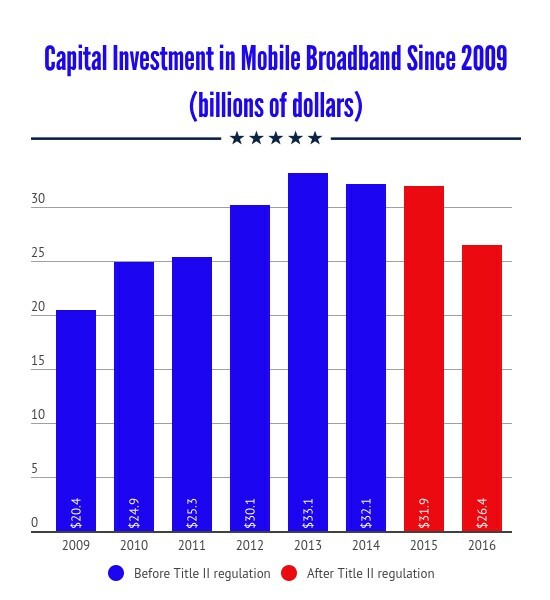 Domestic broadband capital expenditures declined by 5.6%, or some $3.6 billion, which marked the first time that such investment declined outside of a recession during the internet era. That applied to both large and small internet service providers. “Proponents of heavy-handed internet regulation continue to employ irrational scare tactics and hyperbole in their effort to regulate the internet more heavily, but their claims are contradicted by straightforward history and logic. All reasonable people agree that the internet should remain free and open, which was how the internet operated for two decades across administrations of both parties under the light-touch regulatory approach. As we at CFIF have detailed, the internet flourished over two decades like no other innovation in human history, precisely because of the light-touch regulatory approach started under Clinton as McDowell notes, and continued through the Bush Administration. But in 2015, Obama’s FCC under former Chairman Tom Wheeler decided to “fix” an internet that wasn’t broken by regulating it as a “public service” under the 1930s copper-wire telephone laws that McDowell references. As Chairman Pai recently noted, domestic broadband capital expenditures fell for the first time ever outside of a recession. It’s unfortunate that a federal bureaucracy decided in its wisdom that regulating the thriving internet as a “public utility” under a 1934 law was a good idea in the first instance. But as McDowell cheerfully notes, the opportunity to prevent further harm and restore the innovation and investment that characterized internet service for over two decades is here. For that we should thank Chairman Pai and support his common-sense restoration of regulatory sanity at the FCC. Activists advocating heavy-handed internet regulation of the type pushed by the Obama-era Federal Communications Commission (FCC) pretend that they’re the ones crusading on behalf of everyday consumers. The reality is that the internet flourished as no innovation in human history precisely because both the Clinton Administration and Bush Administration maintained a “light touch” regulatory stance from the FCC. But then in 2015, the Obama Administration decided that it must “fix” an internet that wasn’t broken, through a narrow party-line FCC vote to regulate internet service as a “public utility” under 1930s laws enacted for copper-wire telephones. The result: internet infrastructure investment fell for the first time ever outside of an economic recession. Fortunately, new FCC Chairman Ajit Pai is restoring common sense by returning internet regulation to the “light touch” approach that worked for two decades and under Clinton and Bush. – By an overwhelming 78% to 12% margin, voters support the government having little or no regulation of the internet, with 53% supporting a ‘light touch’ and 25% asserting that the government should not regulate the internet at all. – By an 18-point margin (51% versus 33%), voters say the internet should not be regulated as a public utility. – By a two-to-one margin, voters believe regulating the internet as a utility would slow innovation and decrease private tech investment. Chairman Pai is demonstrating admirable courage and leadership in restoring regulatory sanity at the FCC, and it’s always encouraging to confirm that the American electorate agrees with him. In this week’s Liberty Update, we highlight a humiliating new legal defeat for the Obama Administration in its continuing effort to evade legal reckoning for political persecution by the IRS. Now, there’s yet another major court loss to report, this time against Obama’s overactive Federal Communications Commission (FCC). Specifically, the Sixth Circuit Court of Appeals this week rejected FCC attempts to preempt individual state laws aimed at fostering private broadband innovation and growth. For years, the Obama Administration has sought to encourage cities across the country to enter the broadband marketplace, thereby undermining private enterprises in the same business. As CFIF has explained in our ongoing efforts to fight that effort, municipal broadband networks (otherwise known as government-owned networks or “GONs”) end up costing much more to build out and maintain than government officials expect or admit. Moreover, consumers often pay 20% to 50% higher monthly bills than they would with private broadband providers. It’s therefore no surprise that approximately 75% of GONs fail to realize a profit, causing many cities to fall even deeper into debt and end up selling their GONs at enormous losses. The unfortunate experience in Provo, Utah provides a textbook illustration. Municipalities across America have better ways to spend taxpayer dollars than entering into competition against private broadband providers, not least because those private enterprises have invested $1.5 trillion in broadband infrastructure and continue to do so. So mark down another embarrassing court defeat for the Obama Administration as it attempts to occupy as many sectors of the private economy as it can before time runs out in five months. CFIF and other conservative and libertarian groups strongly oppose a new proposal from Obama’s overactive Federal Communications Commission (FCC) to regulate cable television set-top boxes, and that opposition is widely shared among a bipartisan Congressional coalition and even the political left. It’s pretty damning and humiliating that even a counterpart executive branch agency raps the highly-politicized FCC across the knuckles in such an open manner. Nevertheless, it’s a welcome rebuke against the FCC’s proposal, which constitutes a 1990s-vintage, one-size-fits all mandate to make cable TV set-top boxes artificially compatible with third-party devices. It additionally constitutes transparent crony capitalism, threatens consumer privacy, undermines the creative community and damages property rights by facilitating piracy of creative content. And technologically speaking, the set-top box proposal freezes in place an outdated set-top box business model that private innovation and technological advance are already leaving in the dust, with cable companies and other entertainment industry entrepreneurs already abandoning traditional cable boxes in favor of apps and other devices owned and guided by individual consumers. Hopefully, the Copyright Office’s welcome input helps drive a well-deserved nail into the proposal’s metaphorical coffin. Like most Americans, you probably had no idea that the Internet was somehow broken and in need of an Obama Administration “fix” via a Depression-era federal statute enacted for copper wire telephone technology. And with good reason. For two decades, America’s tech and Internet sectors have remained among the depressingly few areas of our economy that continued to flourish amid an era characterized by stagnating growth, employment and incomes. Throughout the Obama tenure, however, his Federal Communications Commission (FCC) has attempted over and over to upend the “light touch” regulatory approach of both Democratic (Clinton) and Republican (Bush) administrations that allowed the Internet to flourish as it has. Today, unfortunately, a sharply divided D.C. Circuit Court of Appeals finally affirmed the FCC’s most recent attempt to impose so-called “Net Neutrality” regulations that essentially equate to ObamaCare for the Internet. Fortunately, this doesn’t end the question. The ruling will likely be appealed, and the FCC’s mismanagement can be corrected via Congressional action or new FCC leadership in a future presidential administration. But beyond the specific issue in question, today’s unfortunate ruling illustrates again the importance of judicial branch appointments and composition as we approach the election of a president who will make those appointments. Alongside nearly every other conservative and libertarian organization of which we’re aware, CFIF opposes a toxic and wholly unnecessary new proposal from the Obama Administration’s Federal Communications Commission (FCC) to regulate cable television set-top boxes before the clock runs out on the Obama presidency. Mr. Ehrlich gets it exactly right. As we have stated, there is simply no realm of American life today that manifests badly-needed innovation, consumer choice, quality, affordability and sheer enjoyment than the video entertainment sector. The variety and excellence of today’s video choices continues to expand at breakneck speed on (literally) a daily basis. We therefore ask officials at all levels of government, as well as our 250,000 supporters and activists across the country, to oppose what Mr. Ehrlich rightly describes as a looming federal atrocity.